The Soviet spearhead advanced into Finland. The Finns torched any buildings that could offer shelter the invaders, blew up all the bridges and felled trees to slow down the Soviets. The first phase of the battle was a cavalry advance by the Russians. This forced the Finns to deploy most of their troops on the table. The cavalry then retreated and the main battle started. Lieutenant Sasha Fermentov, a collective farm supervisor managed to liberate a double portion of vodka to his tired platoon, and ordered his men to join hands and march in formation, singing revolutionary songs. 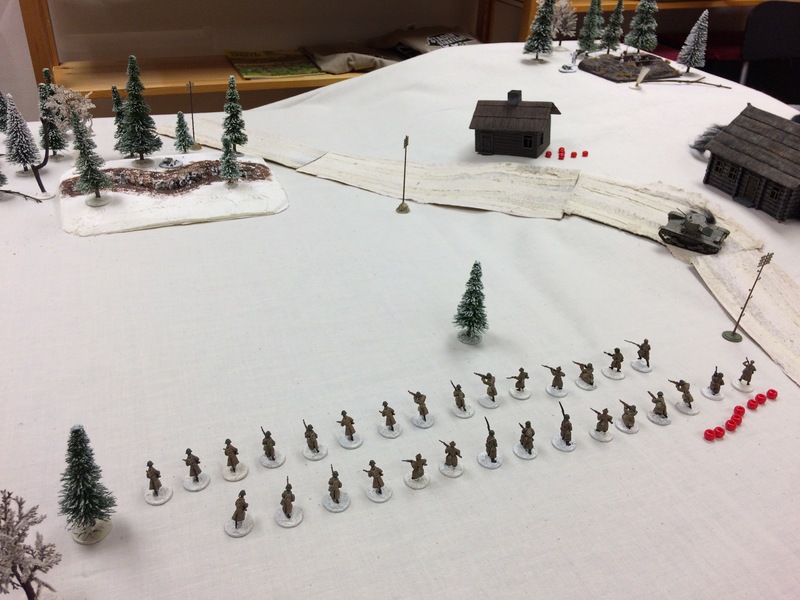 This raised the spirits of the men new heights as they tramped towards the Finnish lines (the Soviet player used a campaign card “Parade march into Finland” and used his support points to buy vodka to raise his force morale). 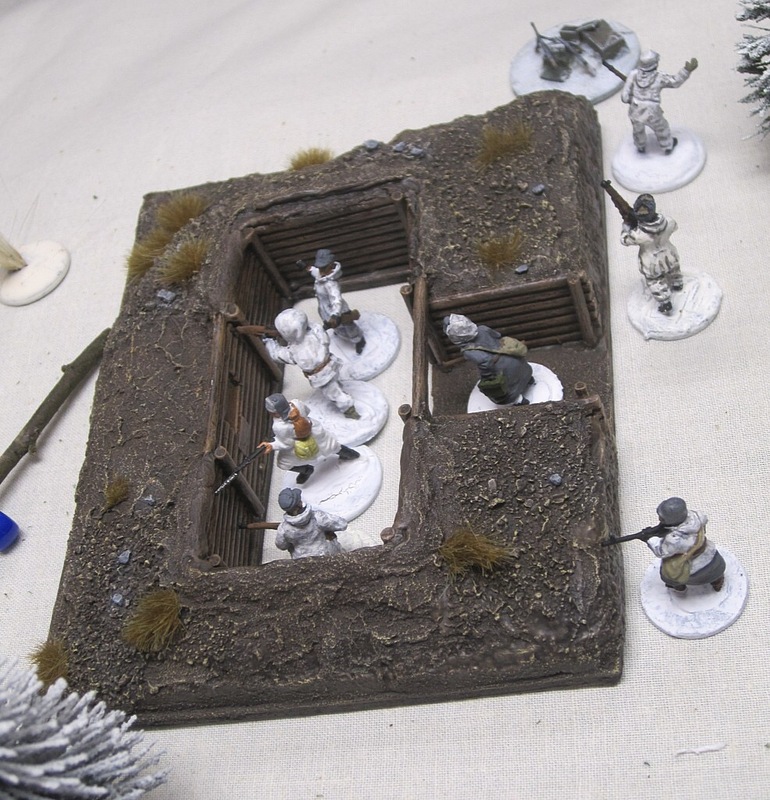 Their objective was a hill with a Finnish bunker the cavalry had identified earlier. The Soviet advanced with their tanks in the lead. The Finns ambushed the first tank with satchel charge but the Soviets played a campaign card “Frosty fingers” which caused the charge to misfire. 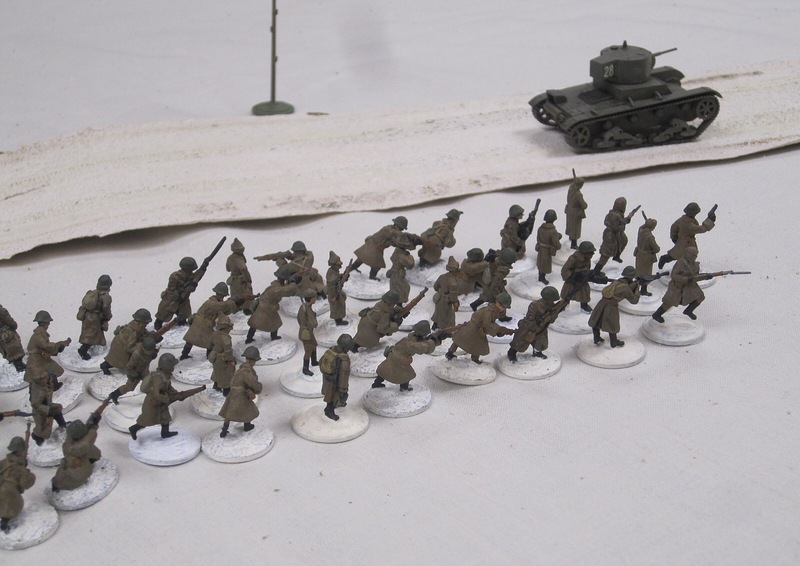 The Soviet infantry started fanning out and engaging the Finns. The gutsy defenders tried ambushing the tank again, and managed to blow one of it’s tracks. The tanks was still engaging the Finns and they tried to finally blow it up with satchel charges. 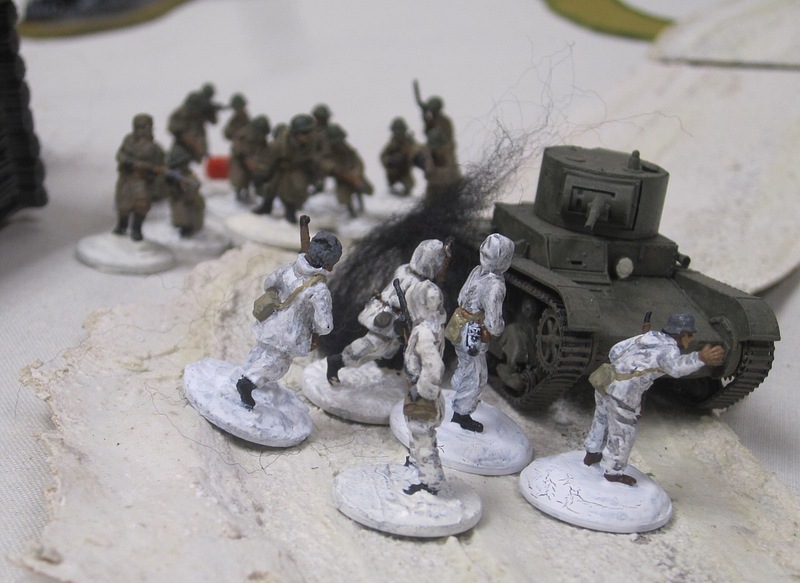 The team was interrupted by a bayonet charge, led by sergeant Roman Gurkin, a veteran of the Polish campaign. He was wounded, but still managed to drive the Finns away and save the tank. 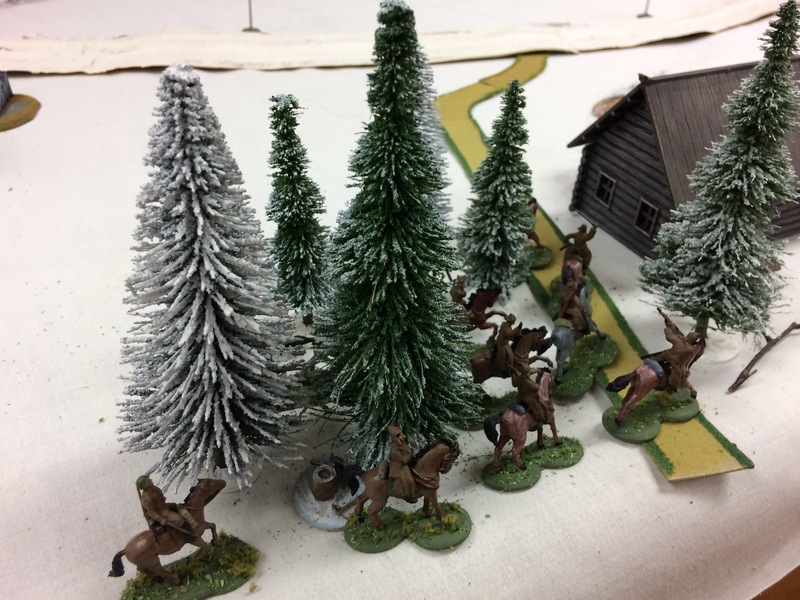 The rest of the Finns soon decided to retire from the field, leaving behind a wounded sergeant and some men. Tonight our troops continued their liberation of the hard working proletariate of the beautiful country of Finland from the vile clutch of Tannerite warmongers and Western mercenaries and their capitalist puppetmasters. In valiant disregard of the deadly traps laid by the white bandits, and in high spirits, our men brushed away the puny opposition of the spineless enemy. The local inhabitants greeted our men with tears of joy streaming, and heartily joining our brave lads in singing the Internationale.